Slack is a closed-source team communication tool similar to IRC but with expanding support for various types of content such as emoji polls, inline images, and attachments. 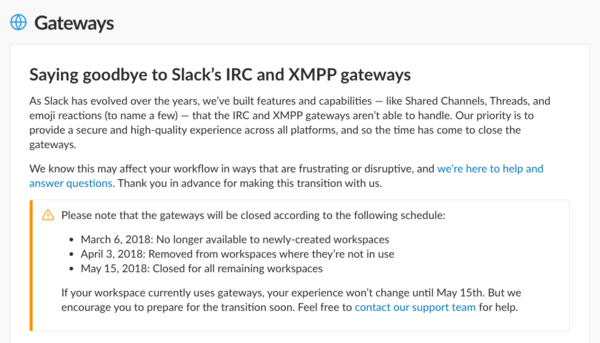 Until 2018, Slack offered the ability to connect to their proprietary system using the open standards IRC and XMPP, but it was announced on March 6 2018 that this support would be phased out, starting immediately and completing on May 15, 2018. We have an IndieWebCamp Slack team. It has channels for each of our IRC channels so there is still one "chat room" per subject area whether you use Slack or IRC. Slackbot is the bot that appears in Slack. It may be possible to POSSE posts to slack, e.g. even photo posts. No known IndieWeb Examples of people POSSEing to Slack. Glitch is a now-defunct game created by the founders of Slack. This has nothing to do with current Glitch thing(s). Slack operated an IRC gateway enabling connecting to a Slack instance from an IRC client. In March 2018 they announced it will be shut down in 2 months. Note that this does not affect the IndieWeb IRC/Slack bridge, since that uses the Slack API directly to connect our IRC and Slack channels. 2018-04-02 John O'Nolan: After 4 years of running a 11,000 member public Slack community ... we’ve decided to shut the whole thing down for good. - thread unrolled. Criticism: scaling limits. "There’s evidence for this in declining usage numbers across most large Slack communities, and just a general fatigue for the format. 2017-06-22 Fast Company: My Company Tried Slack For Two Years. This Is Why We Quit. This remote company decided real-time communication was holding it back. So it built a new tool [[[Twist]]] from the ground up.